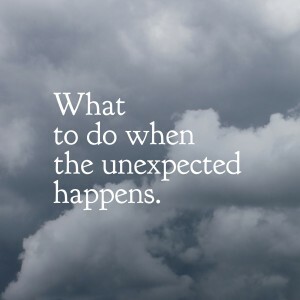 Every event coordinator, no matter how much they plan, will always face that slight chance of something happening on or right before their walk day that changes everything. This year, that slight chance became a reality for the Greenville, SC and Columbia, SC Down syndrome walks when Mother Nature dropped more than a foot of rain in parts of the Palmetto state. 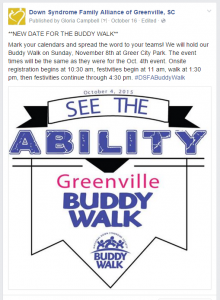 The Wednesday before the Greenville Buddy Walk®, the forecast began to take a turn for the worse with a prediction of up to 15 inches of rain on the day of the walk. 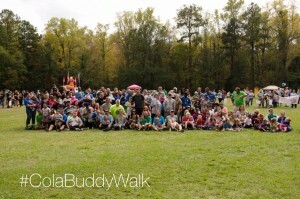 “Normally being as far off the coast as we are, we aren’t affected,” said Rod Storm, the Greenville Buddy Walk® chair. “I started getting emails at work ‘what should we do?’ At that moment, it was still just a forecast.” As the week progressed, it was becoming clearer that it was no longer a question of having a rain location, but that the threat of flooding would be a safety risk for participants. “We weren’t prepared for the high winds and 15” of rain in 24 hours – that means roads were flooding,” he said. Then the Governor of South Carolina declared a state of emergency. “As the chair, I felt responsible. We would be liable if we continued the event, so we made the decision to cancel.” Rod’s walk committee immediately contacted team captains that Friday to notify them the walk on Sunday was canceled. “We sent an email to participants, put it on our website and a lot of our team captains were helping spread the word,” he said. They also made an announcement on their social media accounts. In an email to team captains, Rod advised them to “take this weekend and enjoy time together. 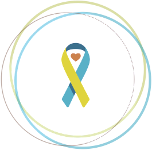 Be safe – that is what is most important.” When a few days had passed and Rod and his committee had a chance to catch their breath, they decided to reschedule the walk for a few weeks later. The venue was already booked so they explored other parks that could provide a similar experience for guests. They spread the word through the same channels they used when they let participants know of the cancellation. While attendance was down significantly from what they were expecting at the original event, everyone who attended the rescheduled walk had an enjoyable time. Rod and his team had to make several adjustments along the way. Because the bands they had for the original event were already booked, they had a DJ provide music instead. The number of volunteers for the event was drastically smaller so Rod triaged by placing volunteers where they most needed them. Their team decided to bring all of the food that was donated for the original walk to the rescheduled event, use what they could and save what made sense (extra bottled water, etc.) for next year’s event. When asked what advice he would have for other event coordinators who find themselves in a similar situation, Rod had two main takeaways. First, continue to praise and support your walk committee members. Thank them over and over. They are doing it for free – thank you goes a long way. When the event went into crisis mode, Rod relied on his committee to get the word out about the cancellation. “My committee was phenomenal,” he said. Rod also stressed the importance of developing and maintaining long-term vendor relationships. The vendors they’d previously work with were much more willing to work them on rescheduling. Flooding had washed away the access road to the event space at the park. Megan and her team reached out to families and friends and were able to secure a Gator for the day to help teams bring items to the tailgate set-up area. “We had the support of our families,” shared Megan, “and we gave them enough notice to reach out to their friends to find dollies, wagons and other help to move their items to the designated areas.” Megan admits, as an event coordinator, that it is hard to plan for a natural disaster and the ability to predict what might happen is impossible.